We asked the BuzzFeed Community to tell us which Disney movie Easter eggs they ~almost~ never noticed before. Here are the insane results. 1. In Toy Story 3, Andy has a postcard from Carl and Ellie that's pinned to the board in his room. 2. In Zootopia, you can clearly see two sibling elephants in Tundra Town who are dressed as Elsa and Anna from Frozen. 3. In Coco, there are Buzz and Woody toys hanging in the town streets. 4. In Lilo & Stitch, David's necklace is identical to Maui's magical fishhook from Moana. 5. In Up, the Pixar ball and a Lots-o'-Huggin' Bear from Toy Story 3 are visible after Carl's house takes flight. 6. 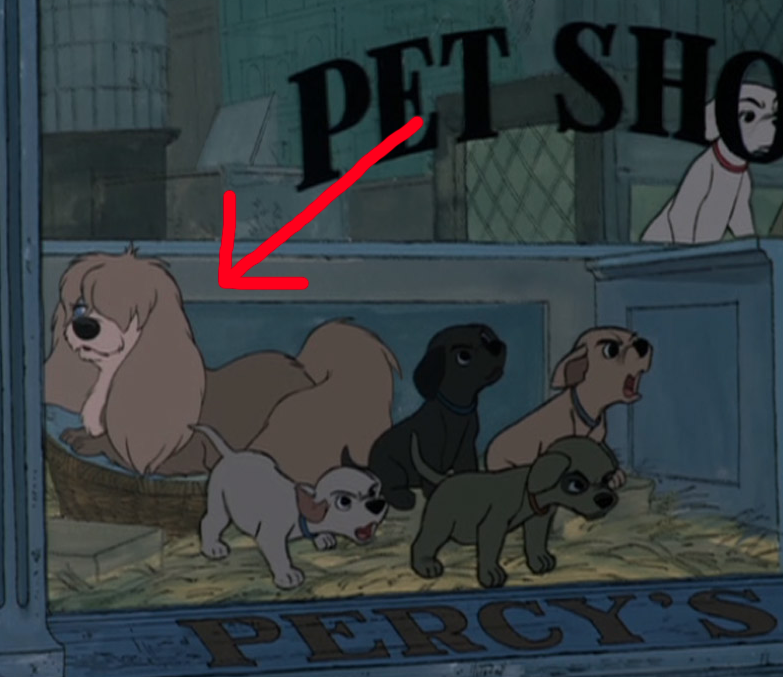 In Aladdin, the Beast makes a cameo in a scene when the Sultan stacks toys. 7. 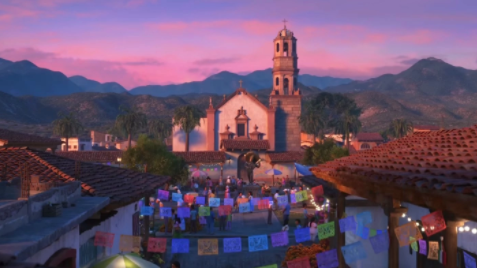 In Cars 3, one of the drivers daydreams about his hometown of Santa Cecilia, which happens to be the city where Coco takes place. 8. In The Hunchback of Notre Dame, one of the gargoyles is modeled after Pumbaa from The Lion King. 9. In Tangled, the magical flower can also be seen at the end of Moana when the island is being restored. 10. In Hercules, Phil and Hercules use Scar's pelt when training. 11. In Tangled, you can spot Pinocchio hanging up in the Snuggly Duckling tavern. 12. 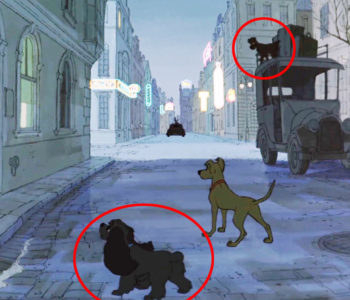 In 101 Dalmatians, several Lady and the Tramp characters can be spotted during the "Twilight Bark" scene. 13. In Aladdin, Rajah's head turns into a hidden Mickey as he changes back into an adult tiger. 14. In Moana, Maui quickly transforms into Sven from Frozen. 15. In Monsters, Inc., Randall claims that humans skin monsters and turn them into toilet seat covers. In the animated short Partysaurus Rex, Sulley's fur appears on the toilet seat. 16. In Big Hero 6, Baymax blows up a statue of Hans from Frozen while training. 17. In The Hunchback of Notre Dame, Belle can be seen as she walks and reads through the village. 18. In Zootopia, the Genie's lamp is visible behind Yax the Yak at the Naturalist Club. 19. In Toy Story, Buzz and Woody stop at a Dinoco gas station, which is the brand that Lightning McQueen tries to get sponsored by in Cars. 20. In Frozen, Elsa's coronation has two special guests: Rapunzel and Flynn from Tangled. 21. In Monsters, Inc., Boo hands Sulley a stuffed Nemo toy when they're in her room. 22. In Moana, Flounder from The Little Mermaid can be spotted during the song "You're Welcome." 23. In The Great Mouse Detective, Dumbo makes an appearance as a bubble-blowing toy. 24. In Tarzan, Mrs. Potts and Chip make their way into the campsite as Jane's fine china. 25. In Lilo & Stitch, a poster of Mulan is visible in Nani's room. 26. 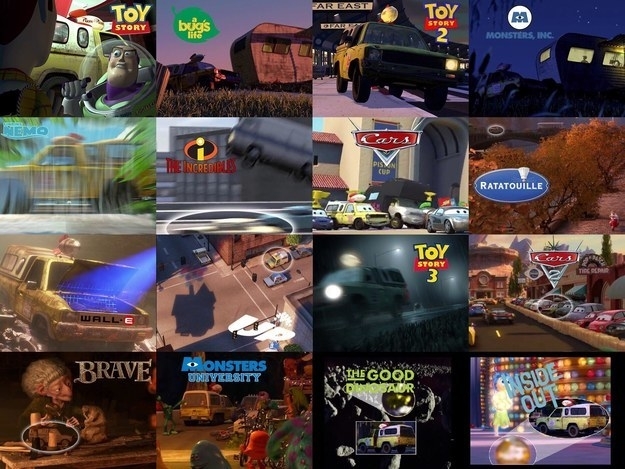 In every Pixar movie, "A113" is showcased, which represents the room number of the graphic design studio that many Pixar animators studied in. 27. 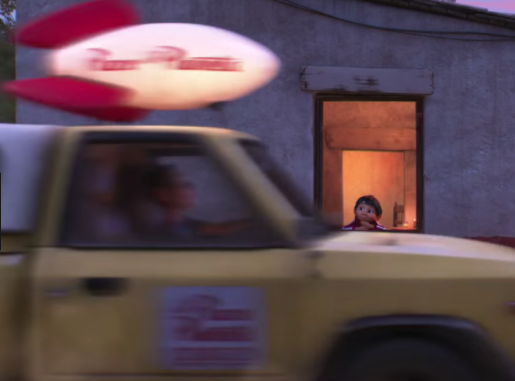 And in every single Pixar movie, the Pizza Planet truck is visible in at least one scene. 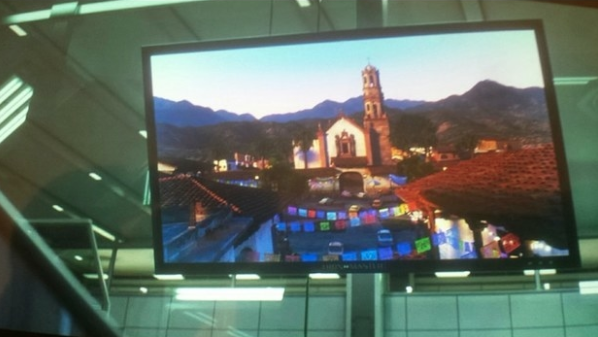 Here it is in their most recent film, Coco.